Engine running: not just ignition in the second position, engine running. French! Yeah the engine needs to be running. Hmmm, tricky. I did test it yesterday without the engine running, so there’s still hope! That car looks sick. The more I see of these new ones the better they get. Thanks mate. I haven’t had time to drop around since grabbing it, appreciate the offer re the window switches though. I might take you up on that! Haven’t asked the Peugeot guy as yet, decided to go with a highly recommended Euro mechanic with Renault experience. He knew all of the details and has done a heap before. I’ll give you the info when I see you next. Unfortunately not keen to take it to Sydney (already have one car to take there), does sound like the best place though. I’m also keeping it in the garage till the belt is done next week. Prob unnecessary, but better to be safe... Hope you found a solution to the airbag light issue. Drive sounds good. Haha must be the sh*tty pic. They’re not sticky at all, but the centre console definitely is! So I’ve tried many different quick and long flicks / presses of the window buttons. Unless there is a real art to it (which kind of defeats the purpose), it doesn’t have the drivers auto down / up function. This is what the switch looks like, doesn’t seem to differ from the passenger side switch. Chance the drivers switch has been replaced at some point? Welcome from another 205 nut. There are quite a few of us on here, owners both past and present. Thanks for that mate. Been looking into the cam belt changed - locked in for next week. How important is replacing the dephaser pulley? Should this be done every cam belt change without fail? It doesnt sound like mine is showing any signs of wear (based on a quick chat with mechanic - no noises at idle and pulls well from 5k), but it's another cam belt change if it goes in the near future. $417 for the part. EDIT: I've decided to just replace the dephaser also for peace of mind. Hi my muffler is original and I’m on 130k km. My experience is pretty standard for Australia, as far as I can tell. Remember that we don’t salt our roads like the UK, which would explain the differences here. Anyway if you’re rust patch is excuse enough for an aftermarket exhaust, go for it! There are heaps to choose from and it’s something that I want to get around to myself. Thanks Sam. Glad to hear that your titanium is still going strong also. Yes, I'm not sure if the wheel is leather either. Feels a bit like rough elephant skin or something (in some areas). Might have to look into costs of recovering. Ok, that's good to know. The exhaust appears to be original, and doesnt sound like it is leaking, it just has a big rusty looking patch on the side of one of the mufflers. I had read (on the UK sites) that the genuine mufflers barely last 40k, but it sounds like it may not be the case here. Thanks for that. The clutch is quite stiff, and travel quite short (which is great), but no worse than previous cable operated Peugeot's that I have owned. I might get it checked out when I get the cam belt done. Hoping it's something that will last for a while yet as it feels good. 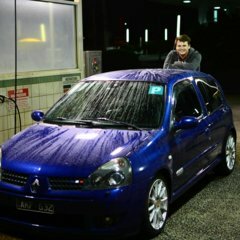 Welcome across to OZRS from another former Aussiefrogger and 205 GTi owner, and congrats on the purchase! I jumped ship and bought my Titanium 182 Cup almost 10 years ago and am still enjoying every drive in it As mentioned above, a quick pull (or push) on the driver's side window button should have it go up (or down) with one touch. For the steering wheel - the Australian sun is not kind to them - I guess you could try cleaning and treating the leather (not sure if it really is leather...). Mine really needs to be re-covered. I'm still on my original exhaust - haven't looked recently for any corrosion, and my car is almost at 160,000 km now. Haven't really heard of issues with corrosion. I had my clutch replaced last year as the pressure plate was going (was very stiff to operate), and Julian from RenoTech recommended I replace it to avoid another part in the clutch linkage (can't remember what exactly, but apparently no longer available new) from failing due to the extra strain. The clutch itself still had plenty of material and was in great condition otherwise - but I guess that depends on the operator. Hey fella! Glad to see you joined. When I get back to Canberra we’ll have to have a catch up. Maybe we can invite @act180to crawl over his meg4. Ive not seen it yet and being currently unemployed, got plenty of time to faff about. The year is the confusion I'd say. My 172 is the same year as yours (2004) but that's compliance date. My actual build date is 2002. 172s came with a spare wheel, and "single exhaust" (hidden behind bumper). It's the 182 which has no provision for a spare wheel as it has 2 mufflers under the boot floor for its dual exhaust with twin exhaust tips protruding from under the bottom of the rear bumper. Hi Ben Welcome aboard! I’m a fellow 182 Cup, er, fellow myself! Your car looks super clean! In regards to the electric window, if you do the shortest of pulls up (or pushes down) you will invoke the auto-up/ down. If you keep your finger on the button for too long it won’t do this. Hops this helps! What makes you think it's not a genuine 172? 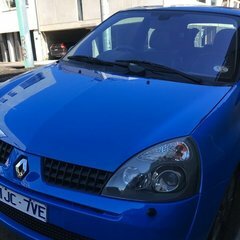 You could make a 1.2 Clio look like a 172 but swapping the running gear etc. just wouldn't be worth while.